1. Back to the elevators for a trip downstairs, through the lobby, and out the doors. This facilitated fleeing in terror, denial, or possibly the cafeteria. 2. Taking a seat in one of the waiting room chairs to read a magazine or gather courage. 3. Straight forward. There was a glass door leading out to a rooftop Healing Garden. When I took my first trip to the third floor, I had just driven 250 miles in about three and a half hours and wanted nothing more than to see my dad and mom. Earlier in the day, my mom had taken my dad to the ER thinking he had perhaps suffered a small stroke. He was clearly unwell. The last I heard from her was that they discovered 5 tumors during a CT scan of his brain. Within an hour of hearing that news, I considered my options, talked to my husband and kids, packed my bags, and jumped in the car to be with them. I had no idea there were many other tumors throughout his body. I was in such a rush when I arrived, I didn’t notice the straight-forward option when I read the sign that took my breath away. I took a sharp left and found my dad, my mom, and what I came to know as the beginning of the end. After a short visit, I took my mom to get some dinner—but more for a break. The hospital cafeteria was closed for the night. On the way to a restaurant that rhymes with Crapplebee’s, she told me about the multitude of tumors in the rest of his body. We nibbled awkwardly as it grew dark outside. She wanted to go home to water her garden and wait for my brother to arrive. Then, the three of us went back to the hospital to visit and say good night, passing under the big bad sign on our way in and out. The next morning, we returned to the hospital early. We rode to the third floor, disembarked, and noticed an outdoor space called The Healing Garden for the first time. We should check that out sometime! we agreed during our left turn to dad. We had our chance when my dad needed assistance with the restroom. We strolled down a hallway, past striding nurses and grim visitors clutching coffee cups, past family waiting rooms, conference rooms, vending machines, and TVs playing for nobody. We stopped in front of the expansive windows separating us from the Healing Garden. 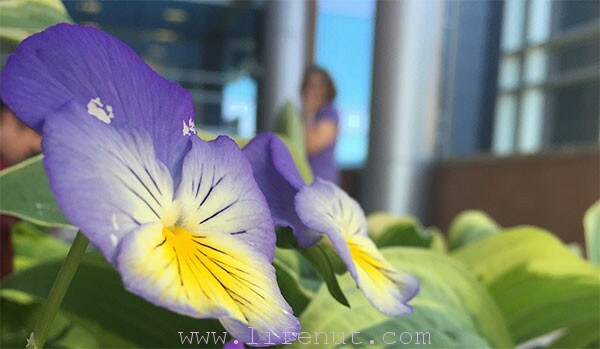 I pushed the glass door open into a shaded oasis replete with hundreds of winking pansies and garish petunias housed in rectangular planters. They are separated by thoughtfully placed benches and tables. On the east end there is a balcony with a view of the city. The south edge of the garden is walled in by upper floors of one of the other wings of the hospital, but vines trail up metallic screens for a more lush look. Along this wall stands a small decorative metal wall carved with the entirety of Psalm 23 in fancy scroll. Also, there is a Boeing 737 jet firing up the engines for takeoff. Or maybe it’s Paul Bunyan vacuuming out Babe’s neglected stall? Maybe that intense mechanical whirring roar sound was temporary? We looked at each other and yelled, “Is it loud out here?” Indeed. It was. The Healing Garden had all the touches of a garden that heals except for one thing. I’m no building systems engineer or designer of ventilation systems, but it seemed as if input/output of the large regional hospital’s heating and cooling system was located in or near the the wonderland of pansies and the valley of the shadow of death. We had to talk to each other in shouts. Forget making a phone call. Maybe, we speculated, the noise comes and goes. We just picked a bad time to visit. But as that day and several following days demonstrated, each visit to the Healing Garden featured the roar of throwing 10,000 accordions into the fires of Modor. When it was very hot outside, it was worse. Bizarrely, we still went out there when my dad needed personal care or we simply needed a break. I enjoyed looking at the stunning variety of pansies and was surprised to see parsley growing there, too. I’d stand at the edge of the balcony to look over the city where I grew up. I’d stare at the mountains to the east and how their familiar presence was like encircling arms. My dad’s job had brought our family to that place when I was a small child. Whenever someone mentioned a trip to the Healing Garden, we’d laugh about it. When my sister and niece arrived from across the country late into the second day, we took them out there without telling them about the roar. “It’s loud! Is it always this loud?” they asked. Welcome to the world’s worst Healing Garden. Laughter. Speculation. We gathered outside as a family for the first time in years. We laughed about it every time we walked by or it was mentioned. I developed a tender spot for it because it tried so hard. The hospital tried. The flowers tried. It was a reminder that there is no perfect slice of peace to be found in a place, ever, because we bring our own noise with us. It was so ludicrous, it healed. The next week, my dad was lying in a bed at the hospice care center after several days at home. His death was near. His room was beautiful, large, gorgeously decorated in the Craftsman style of the early 1900s. There was a balcony overlooking rose gardens and snaking paths. I stepped outside, alone. The only sound I could hear were birds singing and water splashing in a fountain just out of view. It was serene. But there was a roar and it came from my heart. It eclipsed anything I’ve ever heard. Thank-you for sharing so eloquently I cannot wrap my brain around how this happened so fast and how you all are coping and processing at this time. My prayers go out to you and your family. May God give you peace, grace, and His presence during this overwhelming time of grief.